For a limited time only, our 2nd biggest selling central vacuum system in the US is now on sale. The PurVac Emerald and Opal central vacuums are now marked down from their original price for 3 days only. The 4 and 9 gallon models have been marked down by $50 each. Plus there's no shipping, so you can't lose on a great deal like this. Visit our PurVac page for ordering and information. New cutting edge technology now from DuoVac, Canada's largest central vacuum supplier. Absolutely one of the nicest looking central vacuums on the market. Combining this new AmeTek Turbine motor, featuring acoustic sound suppressing material making it not only a beautiful, affordable (best bang for your buck), but also making it one of the quietest vacuum systems in the world. The brushed stainless steal unit is not only unique but the envy of all the competitors in the industry. With a plethora of unique jaw-dropping features it is known as the Silver Bullet. ThinkVacuums.com was hand picked to be the ONLY company to sell this rather unique and awesome system, because our customer service is unrivaled and the sheer amount of business we generate. This is the first of many new models being introduced into the United States. When it comes to your wallet you want to get the most of what you can with the money you have. This system combines High-End technology while being friendly to your wallet. By the way, this company has won the Ludgers & Ludgers consumers preference award in Canada for 11 consecutive years. It is the considered the highest achievement award. They are now on sale on our website. We were only able to get a limited quantity of 325 units for the quarter of production. For the value of this system, they will sell like hot cakes. Mention you saw this blog and we'll take an additional $25 off your DuoVac central vacuum unit. This promotion will only last for 10 days, another Central Vacuum stimulus program we bring to you. Hope you all have a Wonderful Easter and Passover from the ThinkVacuums Crew. And lets not forget our fighting boys and girls overseas. We're proud to announce the Electrolux central vacuum company has just found a new home in our shipping warehouses. Ready to be shipped from over multiple locations all over the United States to get the product to you, the end user. With so many distribution hubs and the famous Electrolux name to back up the product means great value, tradition, quality, and the impectable network of authorized dealers makes it one of the most popular machines on the market. The Electrolux company has already filled our stock rooms up with these new models. Amazing enough, we didn't expect to sell as many as we have so far, considering they just came in on Friday. The exceptional number of orders we're filling today has past the expectations for the introduction of this vacuum system. More info on this will be coming soon. We thank the Electrolux company for giving us the opportunity to sell their state-of-the-art central vacuum system. Customer service is number 1 before and certainly after the sale. We want to give the customer the knowledge to make the best to decision for the best value. For a limited time, we are offering rebates on vacuum systems and attachments kits for 1 week only. 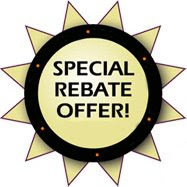 Call us and place your order, mention that you saw this blog and receive your rebate. It's that simple. $15 off new central vacuum systems and $25 on attachment kits. Remember in this economy this is a great deal, don't let this pass you by. This rebate ends soon.